Here's my latest HUZZAH page. This is a new beginning in the story, after Ian Culbard blew up Voldar it gave us the opportunity to start a new thread (he was only supposed to blow the bloody doors off!!). Mindful that most of my HUZZAHs have been about piling on tons of exposition to keep the thing making sense, I enjoyed doing something willfully oblique (even I don't know who these people are or what they're talking about). It'll be up to the HUZZAHs that follow this to make sense of it. Still trying to get to grips with Manga Studio, but I'm having fun along the way and I'm enjoying what it's doing to my comic drawing. In these two panels without the colour you can see the Manga Studio inks clearer. These are done with the brush setting in the pen tool. I have it set to a large nib and make the big marks first. Anything that gets obliterated as I slodge about with the black can be picked out with white afterwards. Technically speaking I didn't blow up Voldar! Great stuff Rob! I'm still to convince myself that Manga Studio would aid me personally - I'm not a cartoonist in the same sense I feel you and Ian are and it lends itself to that approach. Strangely enough I don't think of myself as a cartoonist really, I'm a bit of a jack of all trades who's trying to learn how to draw comics (bit late in the day, I know). Manga Studio forces me to stop trying to fix the marks and shapes so rigidly and just go with what comes out. As a result there's not much point in putting in such intense pencils. basically I work faster and end up with something that looks a bit more dynamic. I hope. The beauty of doing HUZZAH is that I've been able to turn out comic pages whilst working on my approach and also learn from my fellow HUZZAHers along the way. I'd put you forward for the next HUZZAH if I thought you'd be interested. Glad you like the page. 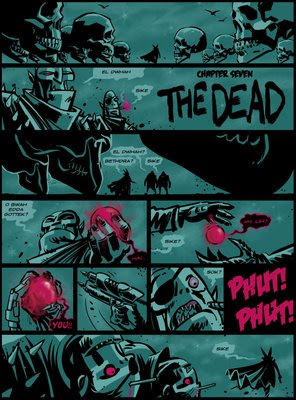 Another great page Rob!It has a real bold confident feel to it,really like panel 4 and how the colour seeps between his fingers. Tempted by Manga studio for the reasons you mention - I'd like to stop fussing, and just draw. That's still a killer page. Manga Studio sounds like fun for a go. These HUZZAH! pages really are something else. Ballsy lines, luvverly colours. Can't go wrong with that!